Savvy Tracker: This utility provides hot keys to help the user trace the precedents of a given cell's formula logic quickly. This tool is a powerful aid in understanding the formula in the cell. When the user has adapted to using this functionality, reviewing models and understanding logic flows can be done rapidly, effectively and efficiently. Example Scenario : "I have a business planning model with complex formulas how can I even hope to understand it?" Savvy solution : "To help you understand this complex business planning model, use Savvy Tracker hot keys. These are short cut keys that allow you to track through the components of your formula quickly (taking a fraction of a second). This speed allows you to fully employ your short-term memory and so vastly improves your comprehension of the model. 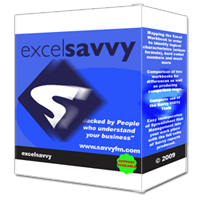 The additional benefit of using Savvy Tracker is that the formula you are tracking will be displayed in the status bar and there is a hot key to return to the original cell so there is no possibility of losing your place."